The current U.S. Supreme Court is infested with politically motivated hypocrites on the left and right. The only difference is that the conservative justices are activists, often choosing to hear cases specifically to overturn established law with expansive rulings that go well beyond the issue at hand. They are far from impartial arbiters of the constitution. They're right-wing political hacks with an agenda. In order of increasing right-leaning predictability they are: Alito, Roberts, Scalia, and Thomas. Thomas, in particular, could easily be replaced by a computer that determined the politically conservative side of issues before the court and automatically recorded its vote accordingly. These justices make a mockery of the Supreme Court, the U.S. Constitution, and their self-professed strict contructionism. The record shows that the current court decides an inordinate fraction of cases by a 5-4 vote. Not just any 5-4, but the same 5-4, the five conservative justices versus the rest. Republicans unrelentingly pander about activist left-wing justices on the U.S. Supreme Court. As can be seen in the table, the opposite is closer to the truth. Left-leaning justices aren't without political bias, but it is the Republican nominated conservative justices who have voted most consistently along ideological lines. Judicial impartiality is a myth. 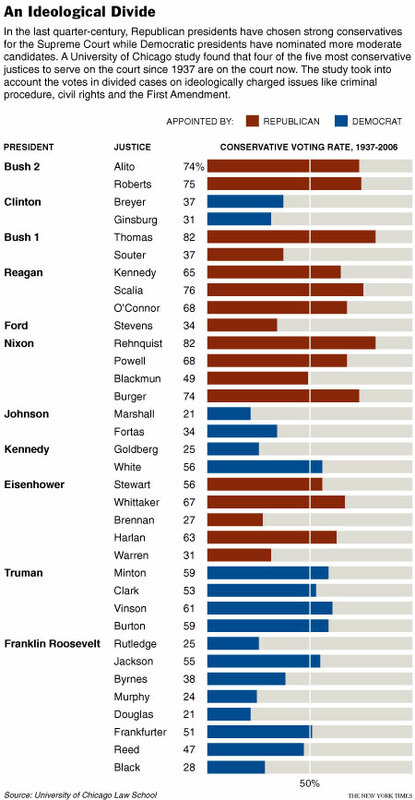 The chart also shows that 4 of the 5 most conservative justices since 1937 are currently on the Supreme Court. This is part of the devastating legacy of Presidents Bush I and II. Sorry, I saw this article, and I saw your link to sign the petition to overturn the Citizen's United case. I can't help but ask, "Have you read the First Amendment and the opinion of the majority in the Citizens United case?" If you had, you would know that the text of the Amendment says the government shall make no law abridging the freedom of speech. It does say anything about speakers. Thus, the government cannot make laws chilling the freedom of speech because of someone's group identity. That would kinda counter to its purpose. So, if the government cannot make a law chilling a group such as I don't know...parties, committees, protesters, radicals, unions, schools, clubs, etc., why can the government tell corporations when they can collectively speak? I thought this was a universal liberal idea that everyone has the right to free speech. Why can't the owners of a corporation enjoy those rights? After all isn't a corporation just a collection of individuals? If we can discriminate speech rights based on group rights, what other groups can be chilled? It does *not* say anything about speakers. Panderbear reads the U.S. Constitution regularly and is well acquainted with Citizen's United. He also reads the Declaration of Independence and the Federalist Papers from time to time. Nowhere do any of these historical documents mention corporations though they did exist at the time. The Founding Fathers were quite wary of corporations in part because of their inherent tendency toward monopoly. Their intent was to bestow rights upon individuals. Even the right to free assembly refers to the individual members of an assembly. The dual notions of corporate personhood and money-speech equivalence both came much later. They were constructed piece by piece over the past 150 years as one corporation after another relentlessly brought case after case to the Court. These two precepts would be anathema to the authors of the Constitution. The proposed amendment to overturn Citizen's United (again only the 5 conservative justices found this new right) does not restrict freedom of speech for the corporeal humans associated with a corporation, only for the fictitious person which is the corporation itself. Furthermore, a corporation's speech is not eliminated but would merely become subject to reasonable statutory law to prevent the most dire of consequences such as we are seeing this election cycle. * When a corporation 'speaks' then it's constituent parts (cells, people, cogs, drones; whatever) cannot speak under penalty of law (anymore than my bowels can speak for me--thankfully not). * I want to see the death penalty applied to a corporation. Until then I cannot believe a CORPORATION has the rights that my neighbor has. The chart seems to show that recent Democrat Presidents have been careful to appoint only people with a strong liberal leading while Republicans have been n more willing to appoint judges for their potential legal contribution rather than their politics. Sorry, but I don't read it that way and those who produced the chart didn't either.